There's a blackout by the mainstream media and the US political elite on coverage of third parties, but RT covered and broadcast this year's third-party presidential debate, hosted by Larry King and featuring a panel including our own Thom Hartmann. On Tuesday night, RT was one of only a handful of media outlets to broadcast the debate, moderated by award-winning broadcast journalist Larry King. 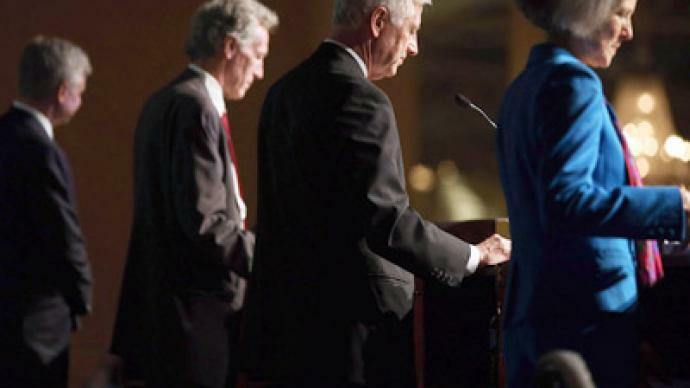 Organized by the Free and Equal Elections Foundation, candidates from the Constitution, Green, Justice and Libertarian parties sounded off on the issues facing American voters, without having to worry about towing party lines for the Democrats or Republicans. The third-party candidates' debate statements, diverse as they were, were a change of pace for the growing number of Americans who see little substantive difference between Mitt Romney and Barack Obama. Though they often disagreed, there was near unanimity on one general concept: The Democratic and Republican parties represent corporate interests, not the average American. Speaking to RT, Free and Equal Elections Foundation founder Christina Tobin said, "We’re going to shift the power back to the people, back to the origins of the Constitution, which doesn’t even mention parties or corporations." 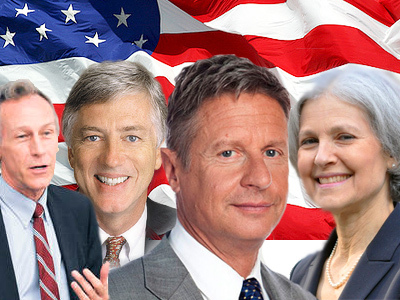 Despite having their voices and positions largely shut out of the two-party system, Libertarian Party candidate Gary Johnson, Green Party candidate Jill Stein, Constitution Party candidate Virgil Goode and Justice Party candidate Rocky Anderson plan to continue their campaigns until Election Day. Largely ignored by the mainstream media, the candidates had few opportunities before this debate to air their positions on critical issues, and their visions for America. At the outset, the four dove into a set of questions submitted through social media – after the debate's hosts forgot to allow time for opening statements. The debate went smoothly after that, and the audience breaking into applause after each candidate’s answer. On one occasion, an answer was even met with boos – hardly the stuff of traditional presidential debates. Before taking the stage, each candidate was interviewed by a panel that included RT's Thom Hartmann and the event's organizers. ­If you missed RT's live coverage, make sure to check out our full video of the debate – and our in-depth breakdown of the four candidates and their positions – below. Representing the newly formed Justice Party, Ross Carl Anderson served two terms as the mayor of Salt Lake City, Utah. A former Democrat, Anderson focused on income-related issues facing Americans, specifically mentioning the "corrupting influence of money" in American politics. The result, he said, was that American officials end up representing whoever floats them the most cash, rather than their constituents. As for the two-party system, Anderson took a clear stance: It's putting a "stranglehold on our democracy." Anderson positioned himself as a candidate fighting for lower-income Americans who often fall victim to both financial interests and law enforcement. He was adamant that Washington must help students facing crippling loan debts and working families facing foreclosure if Wall Street continues to get an unlimited zero-interest credit line. On domestic issues, Anderson said the US Constitution was "shredded" under George W. Bush and Obama, with the National Defense Authorization Act (NDAA) allowing US presidents to imprison anyone for the rest of their lives, without trial or even formal charges. Anderson also insisted on the right to education for all Americans, saying "we cannot afford not to provide" the higher learning that leads to "equality of opportunity." While Washington pushes austerity, he said, Americans must demand prosperity and support the workers and students he says will build the country's future. The War on Drugs was a hot topic at the debate. Anderson was clear that he sees it as a waste of national money, and a "source of unbelievable human tragedy." He noted examples of Americans who will sit in prison for decades simply for selling marijuana, which he said should be legalized. He used the example of alcohol, which was formerly under prohibition, and said drugs should be issues for education and health issues – not law enforcement. Anderson added that the US incarcerates more people for drug charges than the entire prison population of Western Europe. If elected president, he said, he would immediately pardon anyone in jail on a drug offense that did not include any other charge. On foreign policy, Anderson told the audience that under both George W. Bush and Obama, the US has engaged in overseas wars based on a "pack of lies." He said that while the Pentagon warns that climate change is a bigger threat to national security than global terrorism, elected officials are "sound asleep" and asking to increase military spending. He then further explained his stance on foreign wars: The US should not engage in wars of aggression, and should only attack another country if American soil has been attacked first. Anderson also noted that wars of aggression are illegal under the UN Charter, and that the US has lobbied for the prosecution of foreign leaders who commit the same crimes US officials have committed. The nominee from the Constitution Party, Virgil Hamlin Goode, is a former member of the United States House of Representatives who wants to give Americans broader access to diverse political views. He believes that without a constitutional amendment limiting politicians’ terms, the Congress will always be more worried about the next election than solving the country’s problems. Goode kept most of his answers short and sweet, focusing on balancing the US government's budget while respecting constitutional principles. He had little to say that didn't fit into a brief soundbite – and clearly took pride in the brevity and clarity of his answers. In his opening statement, Goode gave a concrete example of what he said many Americans are feeling: That there's little substantive difference between Obama and Romney. "Obama and Romney both claim to support a balanced budget," Goode told the audience, "but the Obama budget is $1 trillion in deficit," while the budget proposed by vice-presidential candidate Paul Ryan would create an $800 billion deficit. Goode proposed spending cuts in various areas. Another of his much-touted concepts was term limits for elected officials, so that they can do their best possible work in office instead of constantly fundraising to get reelected. He conceded that such a proposal would be fought tooth and nail in Washington, and might require a grandfather clause allowing sitting politicians to serve until they retire. He was also adamant about the danger of Political Action Committees (PACs) in American politics, which he said impede the democratic process. "We must throw the PACs out now," he declared. As for the War on Drugs, Goode was clear: He doesn't support the legalization of drugs. He supports cutting back federal anti-drug spending, but noted that would only account for a few billion dollars of the budget, a relatively small sum in Washington's budget. Goode was the only candidate to draw boos from the crowd when he said he would cut funding to Planned Parenthood "to zero." He justified the proposal by saying "we have to reduce nearly everything" to balance the budget. Another of Goode's proposed budget cuts was the Department of Defense. Goode said he supported a strong defense, but not the US' current role as the "policemen of the world." He closed his answer by saying that "the US must stop trying to be the overseer of the world." Goode also said he would cut Pell Grants, veto the NDAA and put a moratorium on green cards for immigrants until unemployment dropped below five percent for American citizens. ­Libertarian Party candidate Gary Johnson is an experienced entrepreneur and a former Governor of New Mexico who, he said, made a name for himself by vetoing legislation. He said he would veto laws that end up costing the American taxpayer more than the country can afford, or laws that dictate what citizens can do in the privacy of their own homes. Most of Johnson's answers dealt with domestic issues. 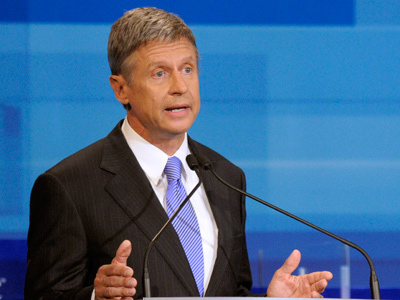 Johnson's first point was that the US political system is in desperate need of transparency. Whether Obama or Romney is elected next month, he told the audience, we will still have "a heightened police state in the US." And Obama and Romney are guaranteed to continue American military interventions abroad, he added. One of the domestic changes Johnson emphasized was term limits for elected officials. Implementing them, he said, would do away with the politician who makes grand promises while campaigning but never fulfills them. He contrasted that approach with his own record, recalling how the term limit for governors forced him to "push the envelope" as much as he could while in office. One way Johnson said he'd push the envelope as president would be to abolish income taxes on individuals and corporations. He linked the tax issue to an impending "monetary collapse," in which US dollars would be worthless thanks to the country's debts. However, he saw taxing marijuana as one alternative to outlawing it. "I have drank alcohol," he said, "and I have smoked marijuana. … I can tell you that in no category is marijuana more dangerous than alcohol – yet we are arresting 1.8 million people a year on drug-related crimes." He claimed that fully half of the US court and prison budget every year goes to drug-related offenses, and asked, rhetorically, "to what end?" He was also clear in his position on education: "the notion of 'free' must be put to an end" in the US, and that would include education. He argued that the system of guaranteed federal loans allows universities to charge whatever they want due to immunity from real pricing mechanisms. Johnson repeated throughout the debate that thanks to American wars abroad, the US has unnecessarily made millions of enemies around the world. The use of the military, he said, is to defend the country, not invade other nations. "The biggest threat to our national security is that we're bankrupt," he told the audience, proposing a 43% cut to military spending that would end every single overseas US military engagement. Johnson stood in contrast to Goode, the other candidate on the right, in his stance on immigration. "Immigration is a good thing," he told viewers, proposing that the US make it as simple as possible for foreigners who want to work to get American work visas. He also called for an end to drone strikes and the hawkish stance against Iran. Along with the other candidates, Johnson called for a veto of the NDAA, saying he would decommission it if elected. He also said he would repeal the PATRIOT Act, and ensure that marriage equality is protected under the Constitution, dubbing it a struggle on par with the Civil Rights Movement of the 1960s. 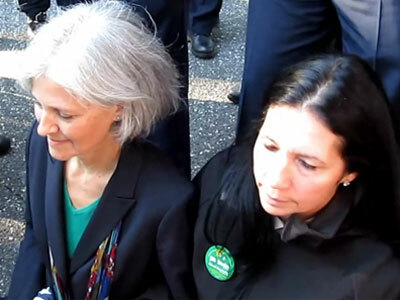 ­Green Party nominee Jill Ellen Stein, a Harvard-trained doctor, stands for social responsibility and renewable energy as a path to restoring the country. She proposed a 'Green New Deal' that would bring renewable energy jobs to the US and push the country towards energy independence. "We could turn American politics on its head," she told the crowd, if students and workers banded together to support a third party. Stein was enthusiastic about the untapped power in third parties. "Ninety million Americans will say no to politics as usual" this election year by not voting, she said. "Imagine what would happen if we let those voters know they have a variety of choices." She opened by criticizing the mainstream debate system, saying Americans "must stand up and demand real democracy – including real debates." She noted how she and her running mate had been arrested and shackled to chairs for eight hours without charge after simply trying to enter the venue of one of the debates between Obama and Romney. The furthest left of the candidates, Stein focused primarily on income inequality and the environment. "The wealthy are wealthier than ever," she said, adding that the rest of Americans are forced to accept the austerity program that allows Washington to spend trillions on wars abroad and pay for Wall Street's bad bets. One solution to the economy under a Stein administration would be new jobs created by green energy. Another would be to make public higher education free for everyone, she said, "as it should be." She noted that it's not such a controversial claim, citing the WWII-era GI Bill for veterans that, she said, put seven dollars into the American economy for every dollar it cost. Stein spoke as a doctor on the issue of drugs: "Marijuana is dangerous on account of being illegal, not illegal on account of being dangerous." The health impacts of the drug trade, she said, are much more significant than those of the actual drugs. "We must use science" to determine which drugs should be illegal, she said, in which case marijuana would be off the list immediately. She repeatedly referred to American students as "indentured servants" of the financial interests that hold their debts. Stein maintained that students, not Wall Street, should be the recipients of federal bailouts. "They are the greatest resource we have," she told the audience. Stein also mentioned several shorter points, including "outrage that the NDAA was ever passed." She called it an "incredible betrayal of our civil liberties," saying the president had "assumed dictatorial rights" by allowing himself the power to imprison Americans indefinitely without charge. Stein also called for the repeal of the laws that allow for assassinations and wiretapping, along with the PATRIOT Act. Finally, she said she would push for a constitutional amendment clarifying that money does not equate to speech, and that corporations are not people. She accused corporations of "stealing our rights of personhood," and subverting individuals in the political process.